Sazon Pork Chops with Peppers, Olives, and Potatoes cook all day with tomatoes and Latin spices. Use the Recipes-by-Photo Index for Pork Recipes to see all the Slow Cooker Pork Recipes that have been featured on this site. I’m a long-time fan of the Goya seasoning mix called Sazon, so when I saw a recipe for Crock Pot Sazon Pork Chops with Peppers, Olives, and Potatoes from Skinnytaste, I knew I’d like the flavors in this dish. Bone-in pork chops are rubbed with garlic, spices, and flour and then they cook all day in the slow cooker with tomato sauce, peppers, green olives, and potatoes. Gina makes her own Sazon mix for this recipe, but you can also buy Goya Brand Sazon at most any Mexican or Latin grocery store. Gina says these pork chops are fall-off-the-bone tender when they come out of the slow cooker. Don’t you think that sounds good? 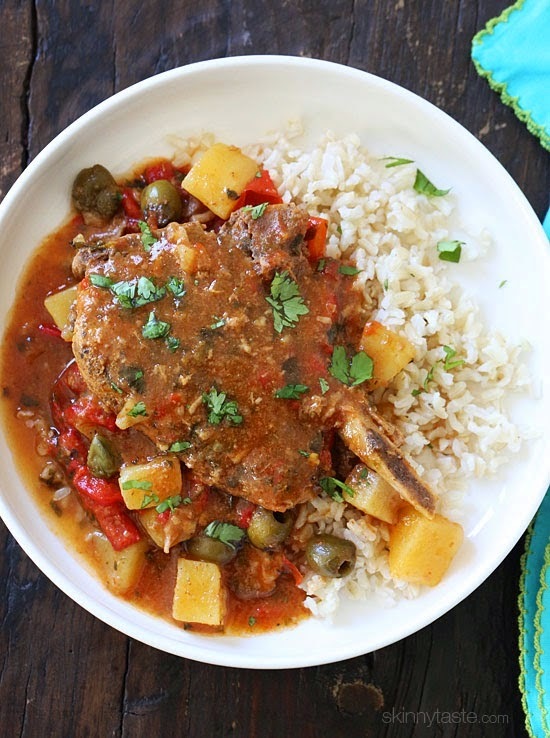 Get the complete recipe for Crock Pot Sazon Pork Chops with Peppers, Olives, and Potatoes from Skinnytaste. Use the Recipes-by-Photo Index for Pork Recipes to see all the Slow Cooker Pork Recipes that have been featured on this site.